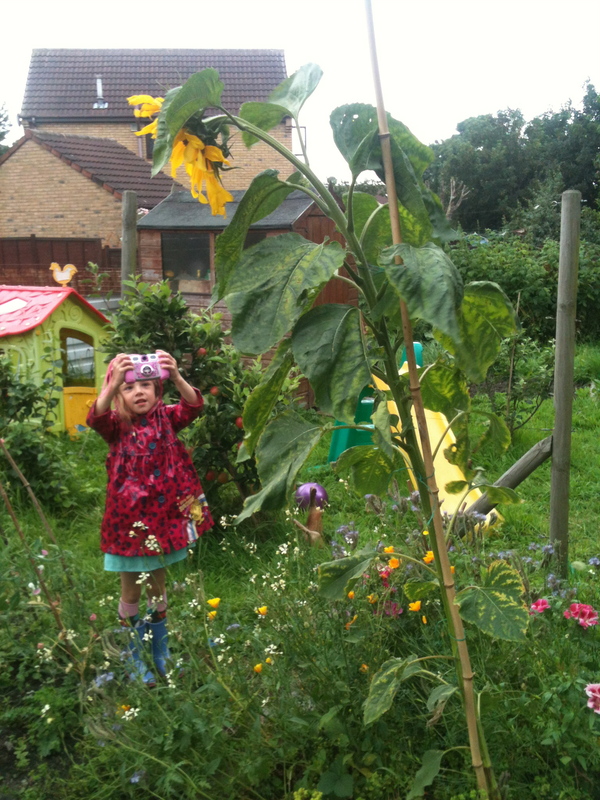 Earlier this year, I was sent some sunflower seeds by the lovely Helen at The Good Life Mum. I planted them with my daughter and she has done her very best to look after them. Many of them grew to about a foot tall and then stopped. We have these in a row outside the back of our house. But, thankfully, one of them grew and grew. I’m so thrilled that she has managed to grow such a giant sunflower as reward for all her efforts – it’s a good lesson for her to learn. Each of my children has a small raised bed on the allotment, and alongside her ‘wild flower’ seed mix (which has been hugely successful and much loved by the bees) she planted one of her sunflower plants. I don’t really have any idea how big it is, as the only scale I have is Eve, who is a tall five year old! Once it’s finished flowering, we’ll allow it to go to seed and then dry the seeds to collect for using again next year.